For those struggling with chronic pain, finding a pain management solution can feel overwhelming. However, many patients are unaware that physical therapy is often the best solution for chronic pain. Chronic pain can occur throughout the body for known or unknown reasons. So whether you are dealing with migraines, lower back pain, or pain from a chronic illness, physical therapy may help. 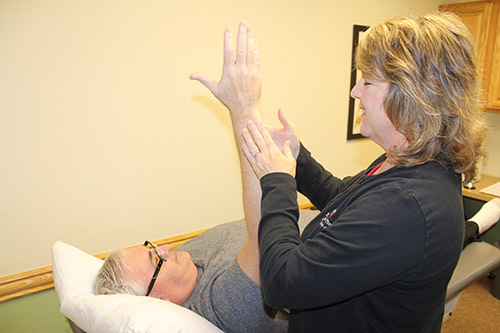 Through organized exercises and therapeutic strategies we strive to help our patients find relief from their chronic pain and increase their mobility. Our proven methods have helped many clients live a more pain free life. Reducing pain is the first goal of physical therapy. Later goals include building muscle strength and flexibility. Both goals help our patients live a better and more functional life. If you would like more information on how we can help you find relief from chronic pain, give our office a call today. Many patients dealing with chronic pain avoid exercise at all cost. However, strategic movement and physical therapy have been proven to greatly aid those dealing with constant pain. Our experienced and educated physical therapists strive to help patients living with chronic pain find the relief they so desperately need. If you have been living with chronic pain, don’t suffer alone any longer. Consider coming in and talking to one of our physical therapists to learn more about how we can help you get back to living your best life possible. Feel free to give us a call during business hours or fill out our online Contact form. We are happy to answer any questions you may have.